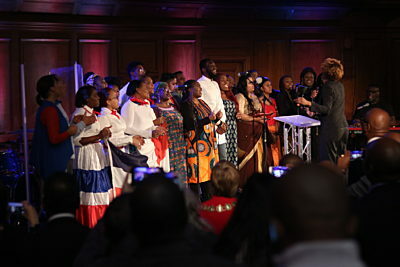 The One People Commission fifth anniversary celebration took place on Wednesday, 21 November 2018 at the Emmanuel Centre in Westminster. More than 400 guests attended the event and roughly 60 individuals were involved in hosting and participating in various aspects of the evening’s programme. The aim of the celebration was to celebrate the One People Commission’s (OPC) five-year anniversary, the journey it has been on, many key people from a wide variety of ethnic and church backdrops who have been involved over the last few years, and to thank God for the unity in ethnic diversity that He has given His church. 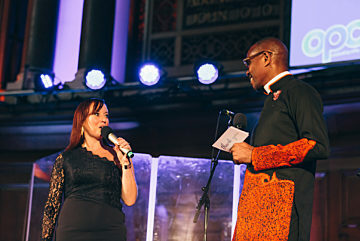 The vision for the event came from Rev Yemi Adedeji, director of the OPC, working closely alongside Steve Clifford, general director at the Evangelical Alliance, and Rachael Heffer from the Evangelical Alliance’s unity team. Along with an OPC core planning team, Yemi and Rachael spent seven months planning the evening, drawing together all teams from across the Evangelical Alliance, with all staff encouraged by Steve to be present and serve as one team in a variety of roles during the evening. The invitations started going out in May 2018 and the social media and communications campaign promoted the event from September through to November, gathering some good momentum and attracting attention to both the OPC event and wider Evangelical Alliance activities. Many members of the OPC network both participated and attended the evening. Many very talented external contributors gave their time freely to be part of the celebration and to work with the Evangelical Alliance and the OPC team in the months running up to it for which we are extremely grateful. Such partnership is key and part of the DNA of the Evangelical Alliance, as is this expression of unity, gratitude to God, diversity, and integration. A special mention must go to Goziam Okugwu who spent weeks ahead of the event liaising with the various performers and participants, and who, along with the Evangelical Alliance’s Eve Paterson, was production manager for the evening. The saxophonists, Wale Olatumbi and Mike Aremu, performed beautifully and we were privileged to have a song written for us by very talented musical directors Añu Omideyi, Nicky Brown, and O’Neill Dennis which formed the finale to the programme. The evening also saw Muyiwa leading worship, Oluwatoyin Ajala delivering a powerful spoken word piece, rap artists Hope Dealers from Spac Nation performing, and young dancers from Bethany Creations bringing a colourful dance element to the evening. It was truly a colourful picture of the joy of the Lord, of genuine diversity the truth integration is possible and diversity is good! 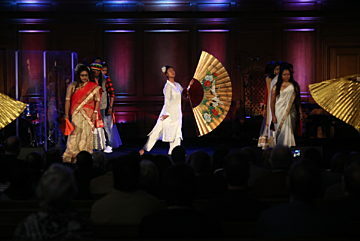 The event was filmed by ABN and GOD TV who also did interviews before and after the celebration. They have yet to air the footage. 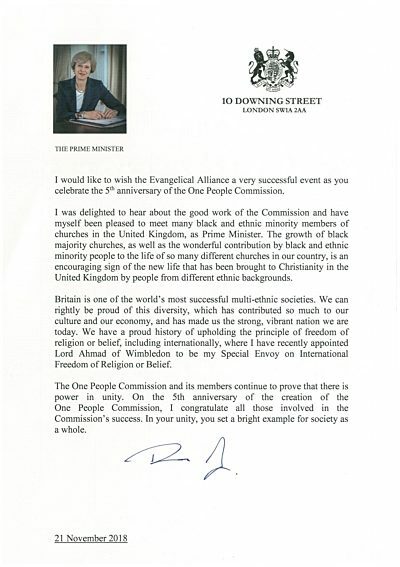 The invitation was extended to a large variety of people — the initial VIP invitation was sent out to Evangelical Alliance board members, OPC members, and other church leaders that are known to the Evangelical Alliance. The invitation was then sent out to a wider variety of people: politicians, more church leaders and then to the public via social media. The Prime Minister, Theresa May, was invited to attend but as she was not able, she sent a letter that was read aloud by Jonathan Hellewell during the celebration. We are now working on the follow up to the event and praying into the legacy that it will leave. From the night itself the Evangelical Alliance gained 16 new individual members and one new member church. Key highlights of the event were the launch of both the South Asian Forum resource ​‘Simply Eat’ as well as the building resource called ​‘Firm Foundations’ – a resource to assist our OPC-linked and other churches with the buildings that they rent, buy, or otherwise. The feedback from the evening has been extremely positive, with people having enjoyed the worshipful nature of the evening, hearing of the journey that the OPC has been on with the support of many key friends and colleagues, but also pointing ahead to the future. We hope to see growth in the OPC network, with an increasing number of leaders, churches, and networks getting involved so that together we can make Jesus known. With the OPC being part of the very DNA of the Evangelical Alliance, we hope that this celebration may exemplify a picture of one church and one people being truly passionate about serving God together, with diversities and beautiful differences, but one shared heart to see the truth of the gospel continue to reach and change our communities and nation with an ever greater impact.